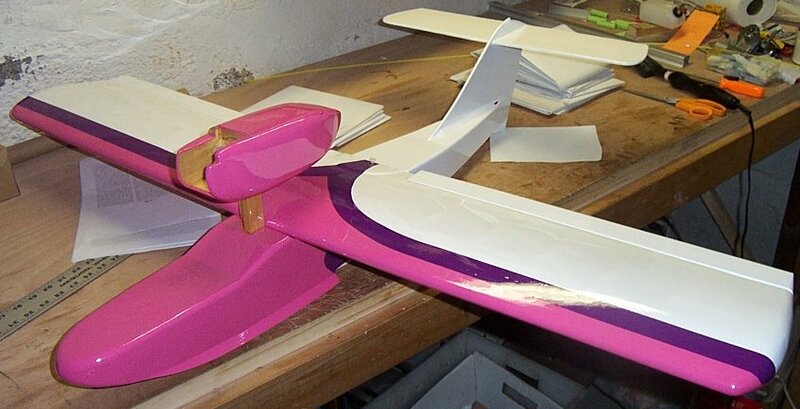 For a long time, designing the color scheme was the hardest part of building RC planes for me. 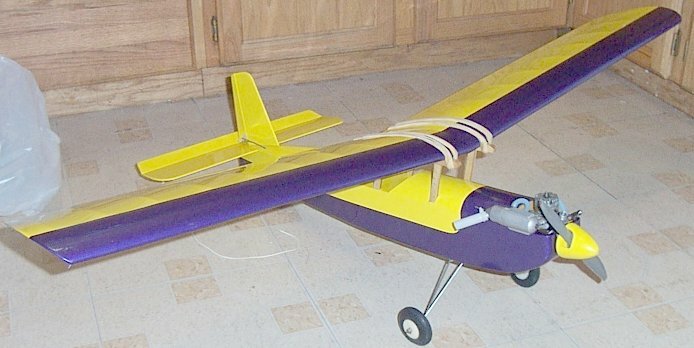 I just couldn’t ever figure out how to put Monokote on an airplane in a way that was original and good looking. Then I figured out that originality was not what I needed. 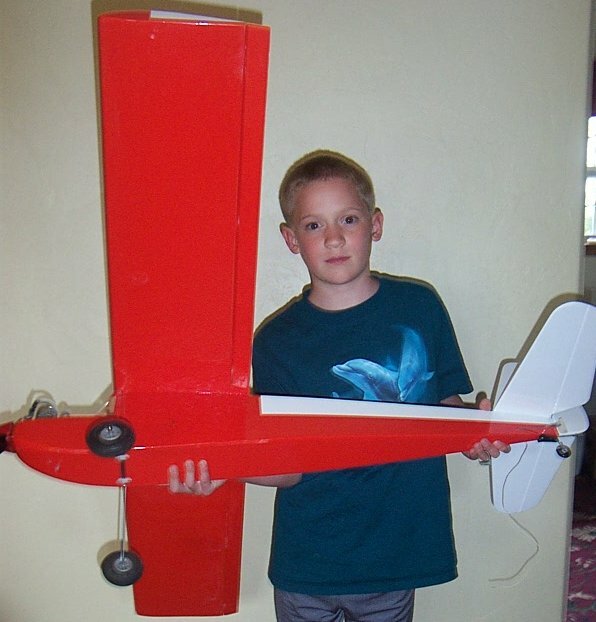 The most important factor in model plane covering is visibility. 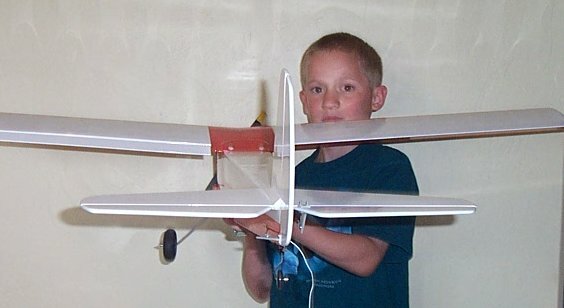 The most common cause of crashing in my early RC flying days was disorientation in the air. Sometimes I’d suffer from what I like to call “silhouette syndrome”, which is when you can’t tell if your plane is turning toward you or away from you. Sometimes you can’t tell if it’s coming straight at you or flying straight away either, although the exhaust sound is a big clue. Without a helpful color scheme, either way looks pretty much the same. 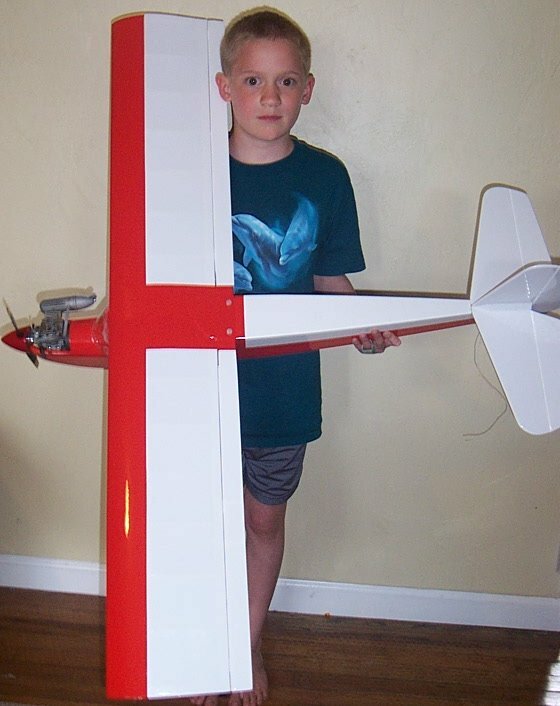 Back in my early days, in an effort to avoid silhouette syndrome I started putting a stripe around the right wing, chordwise, about halfway between root and tip, on every plane. This worked well for a while, until I realized that it just wasn’t pretty. In some cases it was ugly. 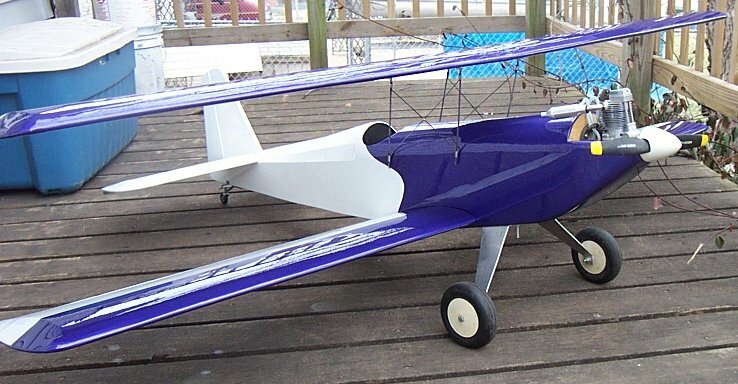 After a little bit of trial and error I came up with the color layout that solved all of my problems and has become the standard Monokote color scheme for nearly every plane I build. 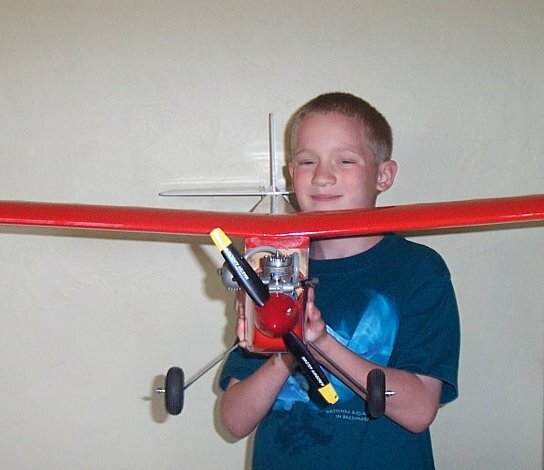 There are just a couple of rules to follow, resulting in a plane that looks snappy as well as making it apparent which direction the plane is pointed at any time. The first rule is that you need two high contrast colors, such as red & white, or blue & yellow, etc. If you want to get fancy you can add an intermediate color, so you would have dark blue, light blue & yellow. Or you could put a black or white pinstripe between the two main colors. 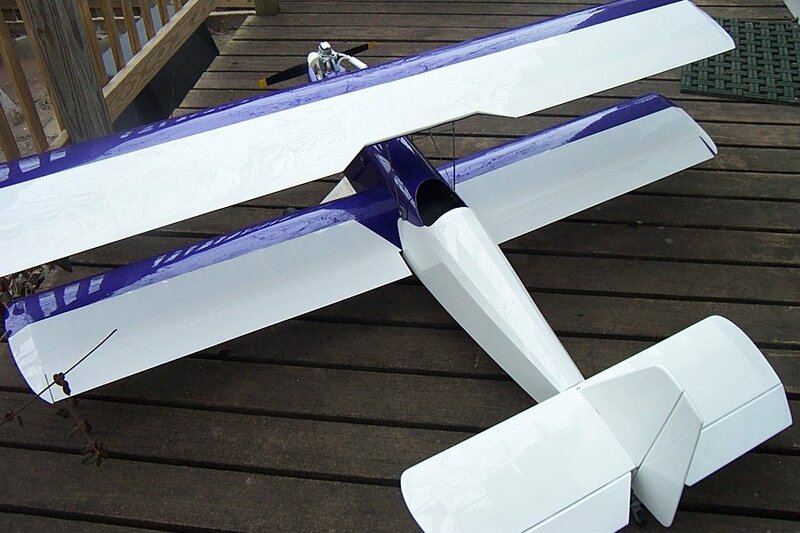 The next rule is that the dark color will be prominently featured on the bottom and front of the plane, and the lighter color will be featured on the top and rear. That’s pretty much all there is to it. The result is that the plane has a distinct look depending on which way it is pointed. Here is my RCM Basic Trainer in red and white. Notice that when it’s coming at you, you see red. As the plane flies away from you, you see a lot of white. There’s no mistaking that! When this plane is in the air it’s immediately obvious whether it’s coming or going. But what if the top and bottom look the same so it’s hard to tell whether the plane is banking toward you or away from you? Imagine that the plane is in front of you flying left to right. It catches a gust of wind and starts to bank a little bit, but you don’t know if it’s rolling left or right because it’s just a silhouette. If you tell it to roll the opposite way to flatten it out, but you guessed wrong, then you are actually telling it to roll more. When it does this you think the wind got worse or something, so you give it more aileron, which puts the plane into a death spiral. It’s always best to be able to distinguish the top from the bottom to avoid this kind of disaster. A light top and dark bottom will tell you immediately which way your plane is turning. When it’s turning toward the pilot, the light colored top comes into view. When it banks away the dark bottom shows itself. Honestly, this isn’t the best looking airplane I’ve ever covered. You can make the same color scheme look a lot better by adding some simple curves or angles. Sometimes I like to put a dart or other shape in the cabin area where the color changes from dark to light. Other than the classic Ugly Stick red with iron crosses, just about everything I’ve built since 1995 has had some variation of my standard color layout. Here’s my ill fated Lazy Ace with a nice wavy line between purple and white. Here’s my Seamaster. I kind of like the purple accent. Here’s a Q-Tee with a three tone color scheme. And finally a purple and yellow Small Wonder. Once your eye gets used to the basic layout, you can customize your planes to give them a little bit of individual character, and you’ll still be able to tell which way they are pointed in the air.